There are at least a dozen very good reasons why one would want to set-up or involve themselves with spy cameras around their home or their property. Most of them involve security. There are no corners to cut when it comes to the comfort and cleanliness of feeling or being more secure. In the digital age, security and informative recording have seen a ton of advancements, as the size and composition of cameras and recording technology grows with the passing of time. Things get smaller, and video gets clearer. So whether you’re ensuring that your car is safe in your driveway, your kids don’t throw parties while on vacation, or you’re a budding horror filmmaker and feel that the hidden camera genre is the way to properly and terrifyingly tell your story, hidden cameras are a great way to go. Benefits of the hidden camera options are really right there in the name; they’re hidden. Thieves, children, and theoretical entities all act very differently when they think they’re not being watched. This is a very seriously constructed list of top-tier hidden cameras on the market today with a wide range in look, a varied selection of type, and a great scale of budgets. Remember that time, just a few seconds ago, when we talked about things getting better and smaller? Well the Spy Camera from Conbrov is a prime example of the length at which the camera and recording market has evolved over the course of the history of electricity. The thumbnail-sized recording device is an essential piece of equipment if surveillance or anything of the sort is on your plans. Roughly the size of a six-sided die, the Spy Camera with Wifi from Conbrov is one of the smallest full-bodied, 960p cameras on earth -- or at least available to the general public, making it a dream to use in any situation imaginable. The square design helps it sit flat on any surface without rolling away, and can be remotely viewed live via a connection over WiFi. 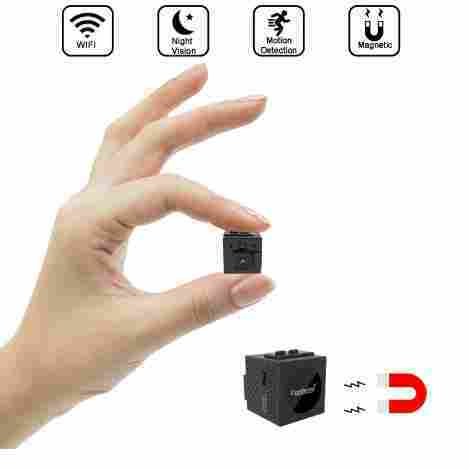 The dream cube hidden camera also has motion sensing modes, and night vision. That’s a lot of grand technology, and a very clever mounting method to pack into such a small electronic package, and it’ll cost you more than you might think after a first glance at the tiny cube. But there’s a ton of applications for a camera of this size, and with this kind of magnetic approach to adhesiveness. The value here is almost all within its application, and the ease at which it can do what you please. This hidden camera is a little bigger than our last one. Have you ever been out and about and suddenly were overtaken with fear over whether or not the kitchen was on fire? We get it. We definitely understand what that feels like, and know that there’s nothing more frustrating than feeling helpless in the meantime. You’ll never feel like that again, though, investing in this hidden camera. Just link the camera to an app and you’re good to go. The monitoring is reliable, fast, and means you never have to wonder about what’s going on in your home again. Checking it on the go means you can be anywhere and look in on your home. You can have that “did I leave my stove on” feeling and be able to confirm from far away that, no, you didn't leave the stove on. One unique feature on this hidden camera which isn't present on the other ones is the fact that you’ll always catch mischief at the moment it happens. The WiFi and phone connection capabilities mean that this will send you an alert via instant message. It will only do this when the motion detection is ignited, making it easy to catch trouble red-handed. Considering the fact that you can also use this as a regular phone charger block, we think it’s a pretty great deal. The price is floating in the average range, which makes it reasonable for those who are looking to invest in equipment that will last, without breaking the bank. The camera is incredible discrete too, making it the perfect thing to leave plugged into your wall socket. The benefit to this plug-in (rather than the wall socket cover style of hidden camera) is the fact that you can still use the charging capabilities even with the camera rolling! Talk about a multipurpose machine. Wondering what to do to keep your home and family safe, but still entertained? Try this 2-in-1 speaker and spy cam. Not only will you be able to play music to keep the family entertained, but no one will ever be able to tell that there’s a hidden camera in there! We love when hidden cameras are able to fit inside of a practical product. 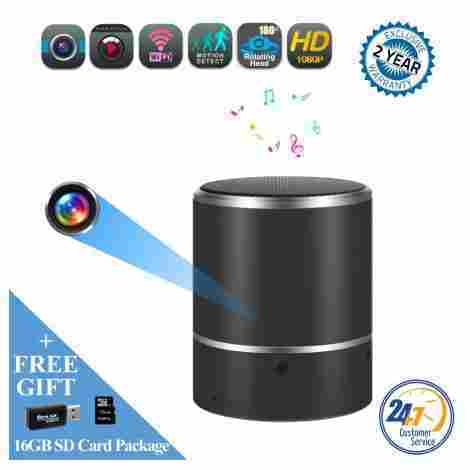 Unlike many hidden cameras which just sit, stagnant, inside of a non-moving, non-working object, this speaker is able to be used as a real speaker. This has the added benefit of the hidden camera being WiFi compatible. Most speakers have to include WiFi options, which is why this hidden camera does too! That’s right. Not only are you getting a music machine, you’re getting safety and security as well. Maybe you don’t want to have to struggle with an SD card every time you want to check up on your cat, kid, or knick-knacks. We get it; pulling out a card is incredibly inconvenient, especially if you just want to peek in on the babysitter while you’re out on the go. Live streaming capacity means you can get the videos sent (and saved) to your phone or laptop. All you need to do is link it up to the app! While this price is one of the higher ones on our list, we think you’re going to feel that it’s worth the price. While it’s true that it’s a little bigger than some of the other hidden cameras on our list, the fact that it’s a working speaker as well as a spy cam is huge. In fact, this 2-in-1 capacity is almost like a 2-for-1 deal. Rather than buying a camera and a speaker, you can purchase one product that gets both of the same results. In our opinion, that’s totally worth the price. This is absolutely the best way to sneakily add a camera into your home or office without anyone noticing anything is different. This hidden camera looks like a regular wall outlet, and doesn’t give away the fact that you’ve got your eyes on the living room (or office) even when you’re not around. The functionality of the camera is great, and it’s compatible with one of the largest SD card sizes on this list. Form and function makes for an excellent product, and this one is certainly hitting that mark. When you’re looking to invest in a hidden home security system, you want it to be truly hidden. You want a camera that isn't going to take hours to set up, place, and sort out the recording functions. This wall outlet spy camera sticks with sticky tape, making it super simple to tack it on and go. This option features a standby mode that will last fifteen days. This just simply means that you can put the camera in PIR mode and it will begin to record if it catches something moving. This is perfect if you're out of town for a couple of weeks and want to keep an eye on your home. At a higher end of average, this wall socket hidden camera is certainly one you need to think about before investing in. The quality is excellent, but the limited placement options could mean trouble. Plus, you can’t use the wall socket that’s behind this hidden camera; it’s just a facade covering up the actual plug. All in all, this is a reliable piece of tech that will absolutely work for your needs. Is it worth losing a living room socket for? We’ll leave that up to you. Want to feel like a super spy? We swear we've seen a version of this in every spy cartoon, comic, and movie that’s out there. All the best agents have their own personal surveillance pen. If you’re unsure of what this is, stop and think for a moment. Many people (especially in offices) leave pens sitting on their desks or tucked into their pockets. If you want to go undercover in the office meeting to catch an inappropriate boss, or even want to bring it to lectures with you to take some sneaky power-point slide photos, this is the hidden camera for you. Many of these hidden cameras have one purpose, and one purpose only: to record video. This hidden camera has two purposes. Not only does it have the option to record video, but it also has the option to take still photos. This is unlike many of the other hidden cameras, which only have the option to record videos. 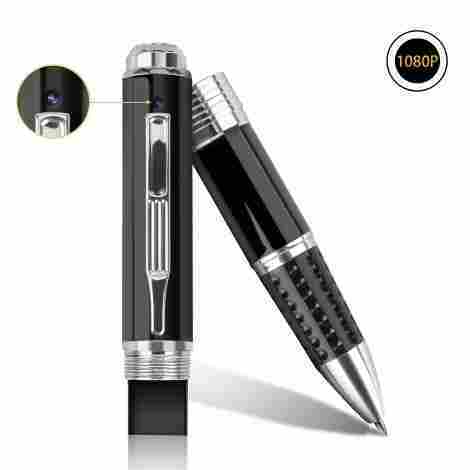 Now you can snap away as easily as you click a pen! So many hidden cameras don’t even come with an SD card, even when it’s integral to the operation of the camera. This hidden camera actually comes with more extras than we know what to do with. Due to the fact that it’s a pen, it needs to have ink. This hidden camera pen comes with 5 ink refills. FIVE! Can you believe that? Plus, the box also includes an extra pen bottom, two USB extensions, and one of those tiny SD card button pushers that comes with cell phones. Once you order this, you’ll never need to order anything else. At one of the cheaper price points, we feel that this pen is definitely worth the amount of money you put out for it. Not only does it have great quality of video and photo, but it also has a phenomenal amount of stuff that’s included in the price. When you get such a great quality product with so many extras, it’s hard to find fault. Is the value worth the cost? Absolutely yes. It’s hard for distrusting people to travel. There’s a certain amount of anxiety that comes with leaving semi-precious belongings in a cheap motel room. Sometimes we don’t have a choice, though. Luckily for all you anxious travellers out there, this hidden camera can help to alleviate some fear and stress surrounding leaving your belongings alone. 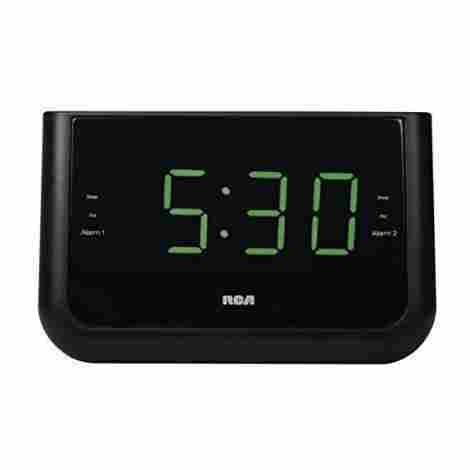 It’s like a top-secret spy has taken the form of an alarm clock and decided to stake out your motel room. Only this time, they’re working for you! This hidden camera is actually inside of an alarm clock that looks remarkably similar to the ones you find in cheap motels. This nondescript outer shell makes it easy to hide in plain sight, and won’t arouse suspicions if you leave it sitting on the bedside table. Don’t want to pay for WiFi? Don’t worry about it. You can still record video while you’re off gallivanting around. This hidden camera records to a micro SD card, and can manage up to 32 GB of memory. While it comes with a 16 GB micro SD Card, you are able to upgrade. Combined with its motion-detecting capacity you’ll never have to worry about missing something important because you ran out of space (or the WiFi cut out). This hidden camera is a unique take on the classic “spy cam”, and is reminiscent of James Bond style spy gear. Combine that novelty with the practicality of the camera itself and you have a recipe for success. We love this camera, and the average price is definitely going to make this hidden camera worth it. 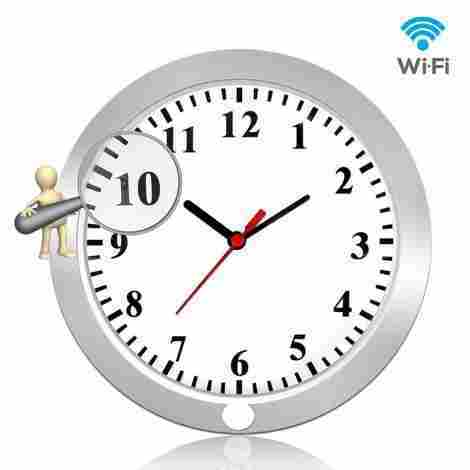 Don’t be shocked that we added this analog clock onto the list. While you might be shaking your head no, we guarantee that the product will convince you “yes”. Not only does it work for home offices, but it blends seamlessly into a school wall. Students, now you can see what your teachers are actually doing before classes, and you can even access it all through your phone. The app makes it easy to find out why Mr. J has taken so long marking those tests; you’ll be able to watch the classroom’s every entrance and exit! Yes, this is a thing that can impact the quality and integrity of your hidden camera. Invisible cameras are much more secure than non-invisible ones. Oftentimes the cameras are the most invisible when they’re being used in an object that already has a hole in it, like a wall socket (which we’ll talk about next). This is one of those rare products that’s got a truly invisible camera, for super-stealth operations, without having any hole at all. What’s worse than a spy camera that everyone can see? A spy camera that doesn't take good quality photos and videos. This hidden camera is truly one of the best, and it’s not just because of its amazing look and accouterments; it’s mostly because of its video and photo quality. The high quality makes it easy for you to figure out who’s been sticking gum under your desk, right down to the brand on the packaging. This hidden camera costs about what you’d expect for such a specific and niche product. The quality of video is incredibly high, which makes it worth every cent. It’s certainly going to give you what you need, without being more than what you can handle. Think of it like the perfect pet, but at an easily accessible price point! 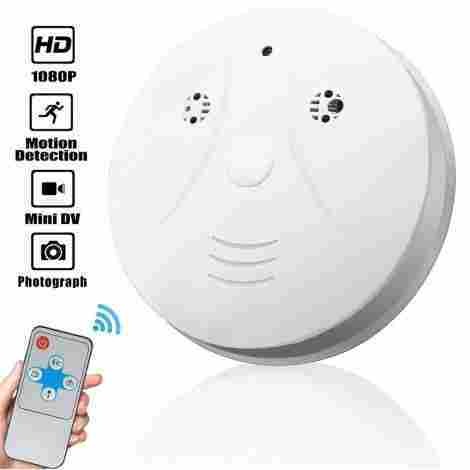 Continuing on the theme of truly hidden cameras, this disguised camera doesn’t look any different from a regular smoke alarm. Don’t be fooled, though. You’re absolutely going to be able to detect more than smoke with this product. You’re going to be able to detect any and all household shenanigans. Marketed as a “nanny cam”, you’re essentially purchasing peace of mind for when you’re not around. Oftentimes what can happen with hidden cameras is that you get a very limited range of sight. You can see the immediate vicinity, but anything that’s a little too far off to the left or right doesn't get captured. With this hidden camera you don’t have to worry about that. This camera captures 5 to 6 meters of vicinity, as well as boasting a wide angle. Combine all of that with the fact that it’s mounted on the ceiling and you’re going to get a huge range of video captured. While you might think this isn't a positive, it’s actually one of the best things for a hidden camera to have. If you’re using this when you’re out, you don’t need to keep the footage for more than a week or two. That gives you time to review it and delete. If you don’t manage to delete it, though, you won’t miss anything important. This hidden camera will record over the oldest files first. This means that you’ll have the most recent recording of the babysitter stealing your silverware, even if you have to accidentally sacrifice the funny video from 6 weeks ago when the cat started grooming the baby. At one of the lowest prices on our list, this hidden camera is an excellent value for the price. While some folks might consider it cheap looking, we have to answer back with “well, what do you expect from a smoke alarm?” The look isn't important with this product. 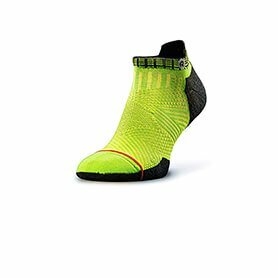 It’s all in the functionality, which we believe is huge. This machine is reliable, rechargeable, and well thought through. What more do you want in a hidden camera? Looking for a solution to prove that your roommate has been stealing your clothes? Look no further than this hidden camera. The clothes hook is a discrete and unique design that fits seamlessly into any room, office, or hallway. It’s weightbearing, which means it can even hold clothes; this ensures no one is going to question why there’s an empty hook floating on the wall. Now you’ll be able to finally solve the case of the clothes caper. Just be sure to plug it in and recharge it before attempting to solve another crime! You don’t want to have to replace the batteries every couple of uses. With hidden cameras it can get very expensive very quickly when it comes to replacement battery charges. 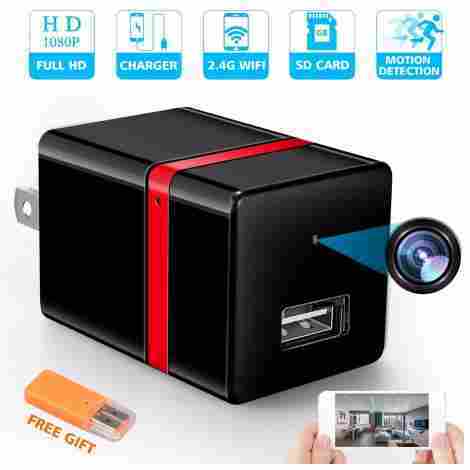 The battery on this hidden camera won’t cost you a dime though! The battery included in the product is a rechargeable battery, which means you plug it in like a phone or computer. You never have to worry about running out of juice in the middle of a night out; this hidden camera will always keep recording, because you never have to worry about running out of batteries. Just plug it in before you leave! In the same way that you want to ensure you don’t run out of batteries, you also want to make sure that you’re not wasting recording space on ridiculous and irrelevant things. This hidden camera features motion detection, which means it’s only going to start recording when it senses or sees movement in its field of vision. This is a great feature for a hidden camera to have, as it means you don’t have to fight your way through hours and hours of an empty room just to find the two minutes of where your roommate stole your Spice Girls sweater. Don’t be fooled by the low price: this little hidden camera packs a powerful punch. The camera itself records high quality video, which makes it easy to make out distinct features and people. The compact size means it’s definitely going to blend in, and the nondescript style of the hook means no one is going to notice. 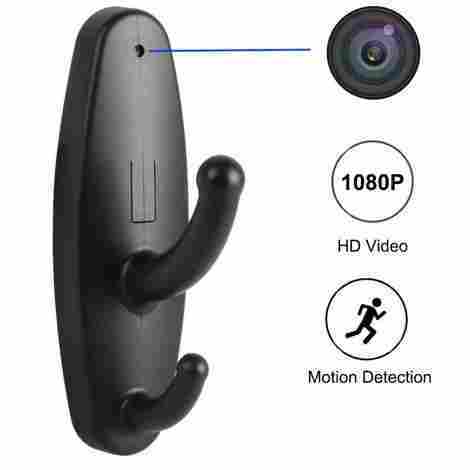 We think that this is an awesome choice of hidden camera for those that are looking for something to stick in a bedroom, living room, or dorm room. Finally we’ve come to our last item on this list, which is the classic spy product that you know you’ve always wanted. Remember all those sitcoms where people hide behind fake plants to spy on their significant others in restaurants, hotels, etc? This is the super secret, 21st century version. Got a date night coming up, but worried about the new babysitter your neighbor or grandmother recommended? Look no further than this potted plant camera. You don’t even need to set the time and date, as the company will do it for you. 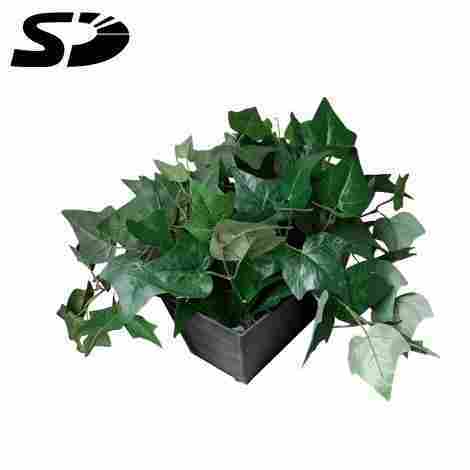 The plant is easy to plug in, and the recording happens all on one SD card. You’ll never struggle with set up, and changing settings is easy with the included remote. Were you expecting the potted plant camera to be inside the pot? Or maybe hidden underneath the vines? If that’s what you expected, that’s certainly not what you’re going to get. This hidden camera construction is way better, and boasts the camera hidden inside a leaf. This makes it easy to adjust the angle of the camera, as the stem is made of easily adjustable wire. Not only will you get the perfect angle, but no one would ever think to check the leaves for the camera. As one of the more expensive products on this list, we feel that it deserves the spot it’s got. While the camera itself doesn't have as many impressive features as other options on this list, the plant cam is just so kitschy and cool. It’s worth buying just for the bragging rights. You are certainly going to be getting a hidden camera that will last you a while, too. Be aware that there’s no audio recording, though. Want to catch your thieving roommate? Figure out who’s stealing office lunches? There’s a spy camera for you. 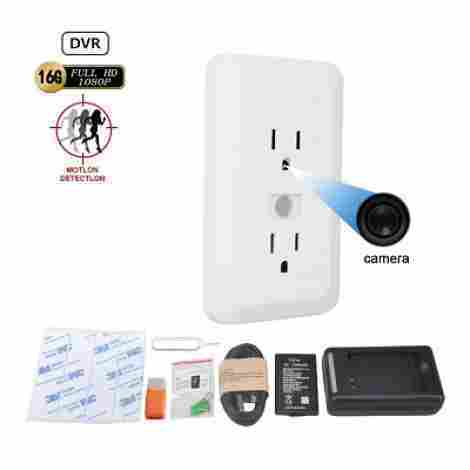 These hidden cameras are the perfect addition for homes, offices, dorms, and porches that could be at risk for mischief and/or theft. We know that you’ll feel much safer and secure once you have the knowledge and security in your hands. Your family will be safe and so will your silverware with these hidden cameras. We’ve compiled the top ten list, but now it’s up to you to figure out which one is perfectly suited for your lifestyle. As most of these products are electronics based consumer goods, it’s tricky to get inside of them and test out their quality prior to purchasing — unless your Uncle Vinny from Toronto has an inside line at the manufacturing plant you’re not telling us about — so there is a lot of trust that goes into making these orders. Which is part of the reason why we’re here. And part of the reason people trust peer reviews so much. What we can judge from product pages and tests is that the practicality of these cameras should be useful, if they’re truly to be hidden, or if not used for another task, at the very least they can be built strong. You’ve got to look for things like flex or reflective glass and plastics, and carbon or at the very least resistant composite metals. Again, the interior of these things will most likely remain a mystery to you, even long after you’ve purchased one. The old adage of “you get what you pay for” should float around the back of your mind when looking to pick up something that is built on the foundation of electronics. This is one of the most fun lists we’ve had to put together because humans and electronic designers are clever, and hidden cameras can be inside or a part of just about anything. This category of electronic is not shy on variety in any sense of the term. There are cameras that live inside clocks for your bedside, or kitchen counter. There are hidden cameras that hide inside the coat hangers you never use near your front door. There are even garden gnomes, and door knockers that also record or provide homeowners with a live feed of their property. You’ll find a ton of variety in the shapes and homes of these cameras, but you’ll also come across, as we did, an extremely pleasing variation of capabilities as well. Some of these cameras come equipped with motion sensors, or still image capture, or 1080p video live-streaming, or 1080p still image capturing triggered by motion sensors. To be honest, we didn’t think there was going to be this much variety in a niche camera department. But boy, were we wrong. One should also consider how it is they are going to place or mount their camera prior to purchasing one, because there are a handful of awfully popular ways, which include adhesive tape, magnetic strips, hooks, or even cameras built to sit atop shelves. We think of nanny cams as the quintessential hidden camera, but there is truly a vastly wide range of products with the purpose of recording something or somewhere, with the added caveat that you also don’t want people or things to know about the recording. With this many options, you should have just as easy of a time finding the exact hidden camera you might need out there. Again, we’re here. There’s no right way to tell anyone that they should spend as much as they can on something. And if we were discussing pencils, or blouses, we might be inclined to say you can go for a cheaper but still alright option. However, you just can’t escape the “get what you pay for” echoes when it comes to purchases made on the fundamental promise that these electronic components should work, and work consistently. There is a pretty large range of variety in this market — surprisingly so — but that doesn’t necessarily mean that the pool you should be looking in can’t be shallow. Find your budget. That’s something you should do before any real purchase. Doubly so here. Once you’ve secured that idea, you can then easily set your sights on finding the right product within that scope, give a few bucks or so on either end. The extreme variety found in the hidden camera market does mean that there is a reflectively wide range of prices out there. Know what you’re getting into, as we tried to pluck as many from the widest range we could while still keeping with quality. Q: What are the modes? A: Great question. There is a pretty common set of modes that you can find amongst the general market of hidden cameras. Not all of the cameras you find are going to have them necessarily, so pay close attention to the selling materials and the product pages. In general, you’ll find modes like Night Vision (helps you see in the dark), Still Imaging (let’s you capture stills from a live video recording), Live-view (lets you watch the feed remotely), Loop Recording (won’t force you to offload video from the card, will continuously overwrite itself), and Motion Sensing (which will trigger recording or still imaging, depending on your settings, when motion is detected). A lot of these will be standard across the average selection of cameras, but do double check to make sure the one you’re buying is going to come equipped with what you want. Q: Will it take SD cards? A: Though it’s not a standard practice, math-wise, it should be. Unfortunately (or fortunately, depending on your preference), not all of these hidden cameras come with the ability to input a micro or mini SD card for easy transfer of data and captures. Though our list might not reflect the market as a whole, there’s a pretty rough fifty-fifty split of cameras that have on-board memory — in which you will have to plug into something to get the footage from — and the other half have memory card slots. Check the product’s description if you’re particular. Q: Will this camera record audio? A: This is actually a really fair question. Not only do some cameras not have the capacity to record audio, it might be illegal under some jurisdictions. Luckily for us, there are options out there for those that want an auditory recording as well as a visual one. Most of the cameras (unless specified) have the ability to record audio. However, some user reviews report that the audio quality is either too quiet to hear, or too garbled to understand. We believe that, as long as you’re purchasing a good quality hidden camera that records audio, you shouldn’t have any issues with the recording of it. Q: Can I watch the video when I’m out? A: Yes and no, depending on the hidden camera. Many of the hidden cameras on our list only record to an SD card. This is excellent news if you want to ensure there are no glitches with your recordings. However, it’s not helpful if you want to check up on the babysitter while you and your partner are out on the town. The cameras that are WiFi enabled should be able to send the video stream right to your phone, and potentially your camera. While you will have to download an app to connect to the camera and use the video, that’s a small sacrifice of phone storage space to be able to check up on your precious children.